"Not only was everyone very nice, but everything was explained to me very clearly." "Dr. Majahan is personable, professional and is a remarkable dentist." "The best dental care I've received in awhile. Dr. Mahajan is very patient." "This is by far the best dentist I've been to." "Very friendly atmosphere, very professional, and flexible with work schedule." "Dr. Mahajan is undeniably one of the best doctors I have encountered." "I'm very grateful to be under Dr. Mahajan's care. She has an engaging and warm demeanor." Alka Mahajan, DMD, brings passion and care to every patient interaction at Progressive Dental Care in Fairfax, Virginia. Skilled in all fields of dentistry, she has a special interest in treating the restorative and cosmetic dental needs of patients. From investing in digital X-rays and CariVue™, a novel radiation-free cavity detection system, Dr. Mahajan stays current in the latest and greatest technologies to best serve her patients. 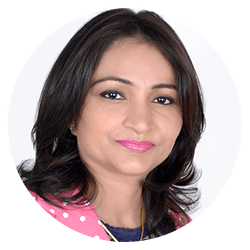 Dr. Mahajan’s dental knowledge and experience is extensive, extending over 15 years, but it’s her gentle approach to care that makes her so well-loved by her patients and respected by her staff at Progressive Dental Care. Her dedication to and compassion for each and every patient is what makes her practice so unique. Dr. Mahajan has two dental degrees, having earned her Bachelor of Dental Surgery in Mangalore, India, prior to coming to the United States. Passionate about continuing her dental career, she attended Tufts University in Boston, earning her Doctor of Dental Medicine degree in 2004. Since then, her enthusiasm for learning has never waned, as you’ll find Dr. Mahajan often at continuing education courses, most recently obtaining certifications in Lumineers, which are a special type of veneer, and Implant Dentistry. Despite her busy schedule, Dr. Mahajan makes time for her family. She loves cooking with them and volunteering at her children’s school. But she can never stay away from dentistry for too long. She often volunteers at the Northern Virginia Dental Society clinic, providing dental care to those who need it most. Dr. Mahajan is excited to share her knowledge and skills to help patients in the Fairfax, Virginia, area and treat their dental care needs. Your visits with us are all about you, your comfort, happiness and complete satisfaction with your care. Our mission is to establish a lifelong bond with our patients and we treat everyone like a member of our family. We offer glo professional whitening! "Dr. Mahajan is profession and always gives good advice on how to resolve teeth related problems." "Dr. Mahajan is the best dentist I've visited. She is patient and explains what is going to be completed. She makes sure there are no surprise costs." "Dr. Mahajan is an A++ dentist. Dental skills beyond comparison to any other dentists in DC metro area. She is nice, friendly, patient and a professional." "Whole experience was very pleasant. Dr. Mahajan was flexible in accommodating me on a Saturday. Good latest equipment made x-rays easy." "This is by far the best dentist that I have been to. Dr.Mahajan took the time to explain everything and was willing to answer any questions I had during the appointment"
"Dr. Mahajan from start to finish was amazing. I am very timid when it comes to dentists, and right when I walked in the door she started to ease my fears. " "Dr. Mahajan took a lot of time to explain what she was doing, and why she was making the recommendations she did." "I went here to get a cleaning and root canal and the dentist and staff were amazing. They made me feel very welcome and they were very friendly and cheerful."